As with most mystery/unknown caches, the posted coordinates are bogus. They are for the State Capital in Helena; a location most deserving of a visit, but absolutely useless in locating the container. In 2004, Haicoole unveiled the California DeLorme Challenge cache. When I learned about this cache and the fun that Northern California Geocachers were having with it I immediately began planning for a Montanan version. Well, here it is finally: the Montana DeLorme Challenge! The DeLorme Atlas & Gazetteer is published for all 50 states. These maps are a favorite among travelers and outdoorsmen and are available at many locations, including online directly from DeLorme. 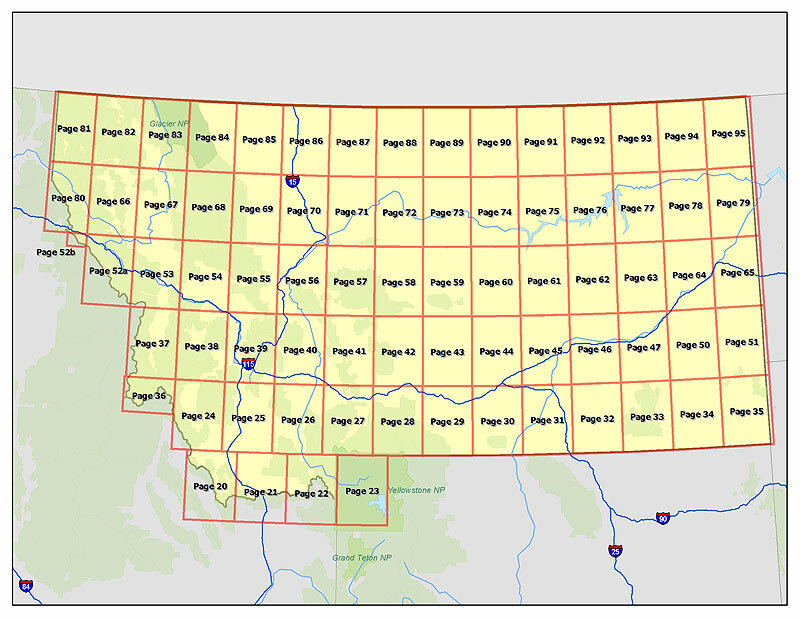 The goal of this cache is simple in concept: to find a cache on each and every block of each and every page of the Montana State DeLorme Atlas & Gazetteer. Achieving that goal is not so simple in practice, of course. The image above shows the geographical extents of each of the pages of the Montana DeLorme Atlas & Gazetteer. The final cache coordinates can be obtained by successfully finding or hiding a cache in each page of the Atlas. In order to claim this cache, you must first create a public bookmark list containing all of your hides and finds. **A Map from the MyGeocachingProfile.com site will also be accepted. ** (Please do not include any locationless caches.) Post a note with the image or link to the list and we will review the list in order to verify the finds. Once everything checks out, we will then send you the correct coordinates for the final cache! The find cannot be logged until the physical container is found and the logbook inside signed. Generally accepted rules, guidelines and conditions for logging a cache find apply. These must be bona fide caches listed on Geocaching.com that you have personally (physically) found and logged. You may include caches found or hidden prior to the creation of the Montana DeLorme Challenge so long as they meet all other Challenge requirements. Placement of a cache on a DeLorme Atlas page counts the same as finding a cache on that page, but only if it was placed prior to May 1, 2007. Hides after this date do not count toward the Challenge. If a Montana DeLorme Atlas page includes space not located in Montana, only caches in the Montana portion count. We will go off of the posted coordinates for a cache when determining in which state or page a given cache falls. If a block does not contain any active geocaches at the time you notify me that you have completed the Challenge, that block may be ignored. 'Active' in this instance is defined as any non-archived cache. Seasonally disabled geocaches are still considered 'active'. While the various editions and versions of the DeLorme Atlas do not seem to have changed much in terms of page boundaries, the coordinates derived from the information in the cache owner's copy (the Fifth Edition) will be considered definitive. We are currently working on updating the cache page to account for the newest Delorme book published in 2013 and it's numbering system. Many thanks go out to Haicoole for the original idea for this cache and to the other cache owners who have taken the idea and run with it for their own states. Special thanks to Moun10bike and the Pennsylvania reviewers who allowed me to copy code and text from their respective DeLorme Challenge caches, and all those who inspired them in their endeavors. MDC-MPS.gdb A Garmin MapSource .gdb file showing the boundaries of the DeLorme Montana Atlas pages. MDC-GE.KMZ A Google Earth .kmz file displaying the boundaries of the DeLorme Montana Atlas pages. Right-click and 'Save As' to download them to your computer. Many thanks to Moun10bike (again!) for creating these files. Be sure to thank him yourself if you get the chance. I encourage everyone to make their DeLorme Challenge bookmark lists "public" and "shared," so that everyone can see how other geocachers are coming along. Tip: Include a bookmark to this cache page on your list, and then everyone's lists can be accessed from right here. I also ask that you think of the *best* cache that you found on each page of the Atlas, for inclusion on your DeLorme Challenge bookmark list. That way, everyone will see how hard you worked to complete the challenge, and we will have a very nice compiled list of Montana's best caches. This is just a suggestion, not a requirement. If the only cache you found on an Atlas page is a micro at a highway rest stop, it's still eligible.